Product prices and availability are accurate as of 2019-04-23 07:36:20 BST and are subject to change. Any price and availability information displayed on http://www.amazon.com/ at the time of purchase will apply to the purchase of this product. 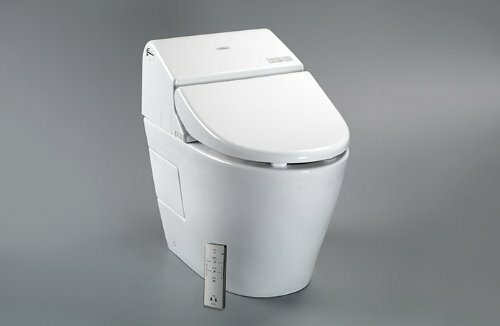 The Washlet G500 comes complete with an integrated toilet delivering a compact design. The Dual-Max Cyclone system flushes either 1.28 or 0.9 GPF. It uses gravity, combined with a cycle bowl cleanse and SanaGloss glaze, which aids in ease of cleaning and long-term bowl sanitation. Features include front and rear warm water washing with temperature and adjustable pressure controls, heated seat with temperature control, automatic air deodorizer, warm air dryer, remote control operation, illuminated touchpad, 2 user memory, auto open/close lid, auto flush, and 12-Inch rough-in. Mounting and connection hardware are included. The item is ADA compliant and features a universal height.